A celebration of making for the Harvard tech community. Projects + Pizza is a celebration of making and creating hosted by the HBS Digital Initiative, the Rock Center and Code@HBS. More than a dozen student makers from across Harvard will present quick demos of a product they’re building. Then, we’ll break out for tabling and more in-depth demonstrations — plus networking and pizza! 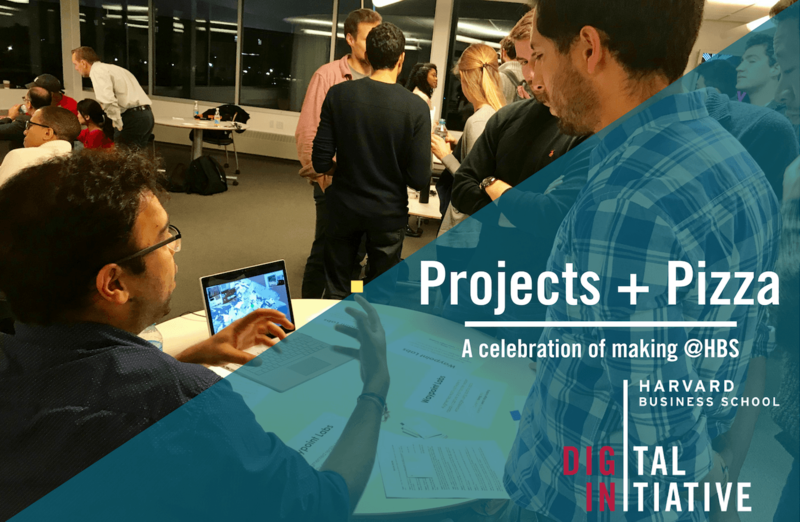 Stop by to learn more about these awesome projects and the greater tech community at HBS. Are you a student at Harvard? Showcase your tech project or product at Projects + Pizza, where it’s ok for ideas to be half-baked — just not the pizza. No need for a polished business idea or pitch, just share what you have with members of the tech community, spark interest in your idea, and meet like-minded students. You’ll have the opportunity to give a thirty-second overview to the full crowd, or you can just participate via the tabling session. Click here to exhibit your project or product.